Vista Cay 3BR Condo Near Occc, Sea World, Universal, Int'l Dr. The Vista Cay Resort is Orlando’s newest luxury resort offering sophisticated Mediterranean Style Luxury in an elegant resort setting. 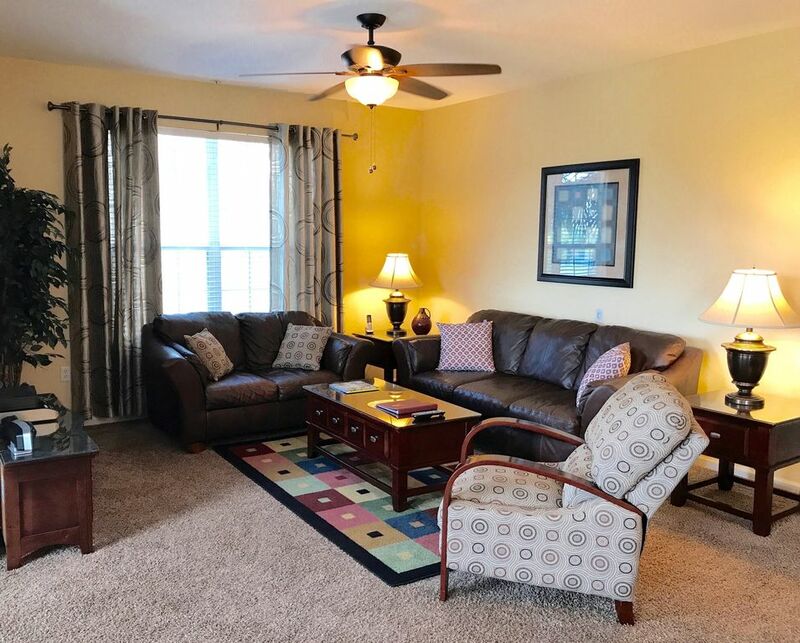 Was furnished in early January 2008 and newly renovated and updated in 2016, has a Total of 2100 sq feet living space in second floor with lake view. Living room has 50' Plasma TV Sony playstation and home theater stereo and DVD player. 43" Samsung Smart TV in Master bedroom. 38' Samsung Plasma TV in second bedroom. 24" Samsung smart TV in third bedroom. Only a 3 minute walk out the back door to new Public super market plaza. Inculdes Free wireless and computer networking station in the office/den. Office/Den has a Queen size sleep sofa. Fully equipment large gourmet kitchen with all appliances. Large laundry room with washer and dryer. Overlooks Sea world fireworks most every night. Only an 8 minute drive to world largest Orlando Prime Outlet Mall and a 15 minute drive from Orlando International Airport. Resort Clubhouse: The upscale clubhouse offers a wide variety of entertaining amenities including a large free-form “infinity edge” pool and hot spa surrounded by palm trees and a lush landscape with a full view of Lake Cay. Inside you will find a fully equipped business center with computers and printer, a games room with billiards tables and arcade games, a movie theater/presentation room, a state of the art fitness center with brand new cardio machines and personal flat screen TV’s. My friends and I recently shared this condo for five nights to attend a convention at the OCCC. The condo was super spacious! Plenty of room for three couples. We had a few problems at check in- the condo was not ready when the owner indicated that it would be and there was a small money discrepancy. We sent a message to the condo owner and the financial issue was resolved very quickly. She jumped on the phone with the property management and all was well. We had to wait a little bit, but overall, we were impressed with how efficiently the issues were resolved. The condo management had provided a list of what was supposed to be in the unit- kitchen supplies, towels etc. My boyfriend is a tad bit ocd and inventoried all of it rather quickly. I was glad that he did because he noted that we were short several towels and pool towels...and were missing a coffee pot. We called the management office and they replaced them right away. The next morning would have been rough without a coffee pot. Our suggestion would be to check the list upon arrival. We were not quite as close to the convention center as we would have hoped. From our door to the door of the west concourse was 1.5 miles. Another part of the convention center was closer. Some of our group drove and paid to park rather than walking it. Not a deal breaker. We would stay here again. We are a family of 4 on this trip. The property was quite, clean and great parking. I wish the pool was open until 1am. It closed at 10p. The main television was a little slow to respond but overall a great place. Four adults stayed here and we found the property had plenty of room and was extremely well equipped. The condo was everything we needed and more. Very clean, modern and accommodating. Beautiful condo and great location. I highly recommend it. We can down for a hair convention!!! This condo is a must do!!!!! Conveniently located off of international drive.. easy access to theme parks. Very clean and spacious... would rent again. Thanks Daisy for letting us rent your wonderful condo!!!!! We couldn't believe the size of the condo. It is absolutely huge and has everything you could possibly need as well as being in a superb location. The condo was spotlessly clean and had several sets of cutlery and crockery so you could stock up the dishwasher and only use it every couple of days. I do all my laundry for coming home and the condo had ample drying space. Everything was perfect and I would definitely stay at this property again. The owner was easy to deal with and we chatted through email a few times before the holiday. She happily and promptly answered any questions we had. Thanks for the review. So glad you enjoyed your stay. Centrally located on Universal Blvd. right off the famed International Drive, you are only minutes from all Orlando has to offer. You’ll enjoy the convenience of being located only .05 miles from the Orlando Convention Center, 2 miles from Sea World, Discovery cove and Anheuser Bush’s newest themed water park, Aquatica, 5 miles from Universal Studios and Islands of Adventure theme parks and only 10 miles from Walt Disney World and all close to world class golf courses, dining and shopping. No cleaning fee if stay is more than 5 nights. heck in after 4pm. Check out : no later than 10am.